It's not easy keeping up a consistent strike rate of hits - even the biggest artists have their fair share of flops. It was also difficult, especially in Australia in the '80s, to land multiple hit singles from one album... for some people. This week in 1987, an artist who needs no introduction debuted with the song that would become her fifth top 20 hit from her then-current chart-topping album. It also became her 15th hit in a prolific three-year period. As we'll see, none of the other acts also debuting this week in 1987 were quite as fortunate. A performer who never had another hit was still enjoying his 15 minutes of fame this week in 1987. "Boom Boom (Let's Go Back To My Room)" by Paul Lekakis spent a third week at number 1. Kim Wilde's career revival didn't last long, as this follow-up to "You Keep Me Hangin' On" - a duet with Junior Giscombe - bombed locally. It was, however, a UK top 10 hit. Their breakthrough had come with the frequently misunderstood - by myself included - "Digging Your Scene" in 1986, and The Blow Monkeys returned in 1987 with another political statement in the form of She Was Only A Grocer's Daughter. Their third album's title was a reference to then-British prime minister Margaret Thatcher, to whom the sophisti-pop band were staunchly opposed. Underneath the glossy sheen of lead single "It Doesn't Have To Be This Way" no doubt lurks another pointed statement about British society at the time, but I can't quite put my finger on what it is they're saying. The track became the band's biggest hit in the UK, but in Australia, "Digging Your Scene" remained their only top 50 appearance. With Queen between albums once again, what better time for Freddie Mercury to resume his solo career? Before he got involved in all things Olympic, the now moustache-less singer reworked "The Great Pretender", a 1955 single by The Platters, and revisited some of his most memorable instances of play-acting in the music video. A top 5 hit in the UK, the cover version just missed becoming Freddie's second solo top 50 single in Australia. From "The Great Pretender" we move now to The Pretenders, who'd been experiencing real mixed fortunes on the Australian chart all decade. This latest single from Get Close provided another upswing, returning the band to the top 10 and giving them their highest peak since debut hit "Brass In Pocket" in 1980. The success of "Hymn To Her" also marked the first time the band had really succeeded in Australia with one of their more subdued songs - "2000 Miles" only reached number 30, while "I Go To Sleep" didn't chart, for example. Inevitably, the next downturn wasn't far away and it would be a long seven-year weight for The Pretenders to return to the top 50... with another ballad. Next up, an artist who'd had a fairly consistent run of hits throughout the '80s... until now. Yes, it still made number 33, but "Day-In Day-Out" was the lead single from David Bowie's first studio album in almost three years, and his previous three albums had been kicked off by songs that reached number 12 ("Blue Jean" from Tonight), number 2 ("Let's Dance" from the album of the same name) and number 3 ("Ashes To Ashes" from Scary Monsters (And Super Creeps)). Not only a chart disappointment, the fairly repetitive "Day-In Day-Out", which was about the homeless problem in America, was also a bit of a let-down musically. Like with The Pretenders, there'd be a long wait until David's next ARIA top 50 appearance... in 1996. The band behind this remake might have been a one-hit wonder, but "Lean On Me" became a hit in Australia for a second time when American R&B group Club Nouveau took it into the top 10. The song, originally a number 24 hit for Bill Withers in 1972, is also one of the most recorded songs of all time - covered by everyone from Michael Bolton to Garth Brooks over the years. Formed following the dissolution of Timex Social Club (aka The Social Club) by producer Jay King, Club Nouveau featured among its line-up Denzil Foster and Thomas McElroy, who'd go on to put together En Vogue. Club Nouveau achieved one more top 40 hit in the US, "Why You Treat Me So Bad", but never graced the ARIA top 100 again. 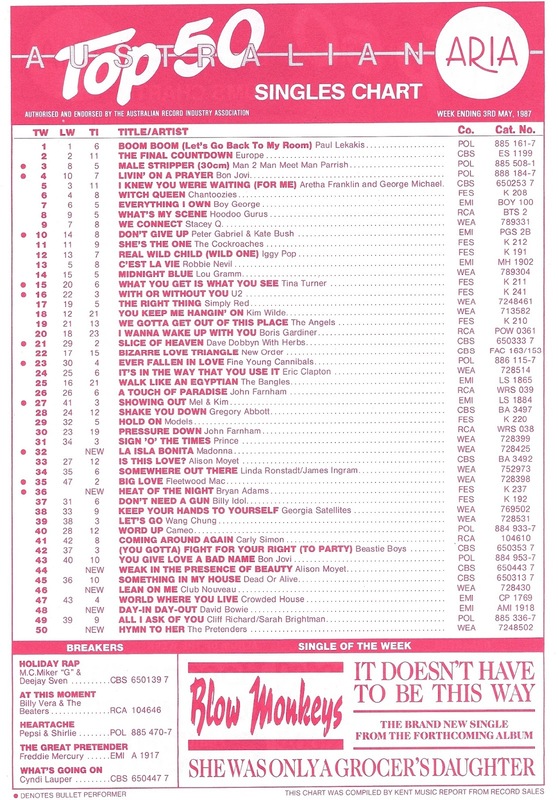 Here's another song reaching the top 50 for the second time, but the first appearance of "Weak In The Presence of Beauty" had only been in mid-1986, when original performers Floy Joy took it to number 29. The fact that it had so recently been on the chart might explain why the tune didn't do so well for the normally more successful Alison - it peaked one place below Floy Joy's peak despite having been a top 10 hit in the UK (where the original version had flopped). Interestingly, Alison has since been quite outspoken about the fact that she only recorded the song because she thought it'd do well and doesn't really like it. That makes two of us. He didn't have as extensive a chart history as David Bowie, but Bryan Adams would also have been justified in expecting better from this lead single from his fifth album, Into The Fire, especially given how successful previous album Reckless and its singles had been locally. But like "Day-In Day-Out", "Heat Of The Night" just wasn't up to the same standard of songs like "Run To You", "Heaven" and "Summer Of '69". In fact, I don't even really remember "Heat Of The Night" from the time and was only vaguely aware Bryan even released an album in 1987 - something that's hardly surprising since this was its only single to reach the top 50. In a week filled with acts that had trouble regularly achieving hit singles, it's fitting that the exception to the rule is a singer whose biggest fall from grace to date had been the fact that her previous single, "Open Your Heart", had only reached number 16 (breaking a lengthy run of top 10 hits). But that'd been pretty much what you'd expect for the fourth single from a number 1 album. And yet, along came the fifth single from True Blue - an album which returned to the top 50 for a 38th week this week - and peaked 10 places higher. Clearly, the reason "La Isla Bonita" did so well despite it being the album's fifth single is that the Latin-influenced track was unlike anything Madonna had ever released before. It was also the type of song that would've made people who didn't like her pop/dance sound sit up and take notice - then go out and buy it. Throw in yet another image change (or two) in the music video and it proved yet again that she knew when the time was right to mix things up. An early version of the song had been offered by co-writers Patrick Leonard and Bruce Gaitsch to Michael Jackson, but when he turned it down, Madonna added her own contributions to the track and slotted it into True Blue. 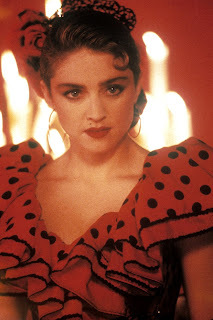 As well as being among her most successful singles of the '80s, "La Isla Bonita" seems to be one of Madonna's favourite songs as well, with it regularly featuring in her live sets ever since its release. The video is worth rewatching, if only for the old guy at the end who dances in the street with Madonna holding his shopping bags. Next week: Madonna's first top 50 hit returns to the chart... kind of. Plus, chart-topping band + top songwriter + hit movie = smash hit single. I've never been that fond of 'Another Step (Closer To You)'. It sounds more like a B-side to me. Freddie never quite looked the same without the moustache. 'Hymn To Her' was a nice song. I was quite surprised they had another hit with 'I'll Stand By You', given the long gap between. I worked out how to play the melody of 'Lean On Me' on my sister's toy keyboard, years before taking lessons, it's that simple. I don't think I'd heard the original before. The middle key change section was easily the best part of 'La Isla Bonita' for me. Hey m8 I reckon La Isla Bonita is the dumbest thing Madonna has ever released, and there fore the best. Actually her 80s singles were far better than anything from Vogue onwards which I reckon to be a bit naff. I think American Life just flat out sucked and the rap in it was cringe worthy. I would prefer to forget that whole era ever happened. But Madonna in the 80s was a different beast. I enjoy flashing back to those times man. "Madonna added her own contributions to the track" kind of downplays the fact that she actually wrote the lyrics and shaped the melody (according to Bruce Gaitsch, who wrote the instrumental with Pat Leonard - Michael Jackson rejected the instrumental, and Madonna then wrote the lyrics and shaped the melody while she was in China working on "Shanghai Surprise"). Madonna herself has also stated that she didn't know where she got the name "San Pedro" from for the island, hypothesising that she might have seen it on a sign coming off a highway in LA and taken it from there (there's a San Pedro near LA). Madonna detractors often claim that she's one of those singers who "changes a word, claims a third" (i.e. that she contributes practically nothing to the songwriting process), but all of her collaborators (Pat Leonard included) attest to the fact that she is very hands on when it comes to writing and producing her music and that her credits are definitely not tokenistic (I'm not for a second claiming that you're suggesting otherwise, Gavin!! :-). "Open Your Heart" missing the Top 10 was a massive shock at the time, but this restored order to the pop universe :-). I don't remember it being a shock at all. Everyone who liked Madonna already had the True Blue album by then. The only reason to buy the single would be to get the B side (if it's good and/or you were a fanatic) or to get the 12" version. I don't recall the album version being noticeably different to the single version on the video clip. La Island Bonita would have attracted a different demographic because of its latin influence, in addition to her usual fan base - this is the a likely reason why it charted so well even though it was the fifth single from the album.